Dr. Bin He received his B.S. in Electrical Engineering from Zhejiang University in 1982, and Ph.D. in Bioelectrical Engineering from Tokyo Institute of Technology, Japan, a Nobel Prize winning campus in 1988, both with the highest honors. He completed a postdoctoral fellowship in Biomedical Engineering at Harvard University - M.I.T. After working as a Research Scientist at M.I.T., he was on the faculty of Electrical Engineering and Bioengineering at the University of Illinois at Chicago, where he was named a University Scholar by the President of the University of Illinois. From 2004-2018, he was a Professor of Biomedical Engineering and Director of Biomedical Functional Imaging and Neuroengineering Laboratory at the University of Minnesota. Later he was appointed as a Distinguished McKnight University Professor and Medtronic-Bakken Chair for Engineering in Medicine. At Minnesota, Dr. He served as Director of the NSF IGERT Neuroengineering Training Program and the NIH Neuroimaging Training Program, Director of Graduate Studies for Neuroengineering Minor, and Director of Undergraduate Studies in Biomedical Engineering. Dr. He was the Founding Director of the Center for Neuroengineering from 2007-2017, and served as the Director of the Institute for Engineering in Medicine from 2012-2017 at the University of Minnesota. In June 2017, Dr. He was named the Head of Department of Biomedical Engineering at Carnegie Mellon University, effective Feb. 1, 2018. Dr. He's research interests include neuroengineering, functional biomedical imaging, cardiovascular engineering, and medical device. He has published over 240 articles in peer-reviewed core international journals including Neuron, Brain, Journal of Neuroscience, Proceedings of the IEEE, NeuroImage, Human Brain Mapping, Nanomedicine, Heart Rhythm, Epilepsia, Applied Physics Letters, American Journal of Physiology, Journal of Neural Engineering, and various IEEE journals, including IEEE Transactions on Biomedical Engineering, IEEE Transactions on Medical Imaging, IEEE Transactions on Neural Systems and Rehabilitation Engineering, and IEEE Reviews in Biomedical Engineering. He has also delivered over 40 plenary and keynote talks in various international conferences and workshops. Dr. He’s research has been featured by Nature, BBC, CNN, NBC, CBS, ABC, the Wall Street Journal, New York Times, Scientific American, the Economist, New Scientist, US News, NPR, among others. A video describing his work on mind controlled flying robot has been viewed ~900,000 times. 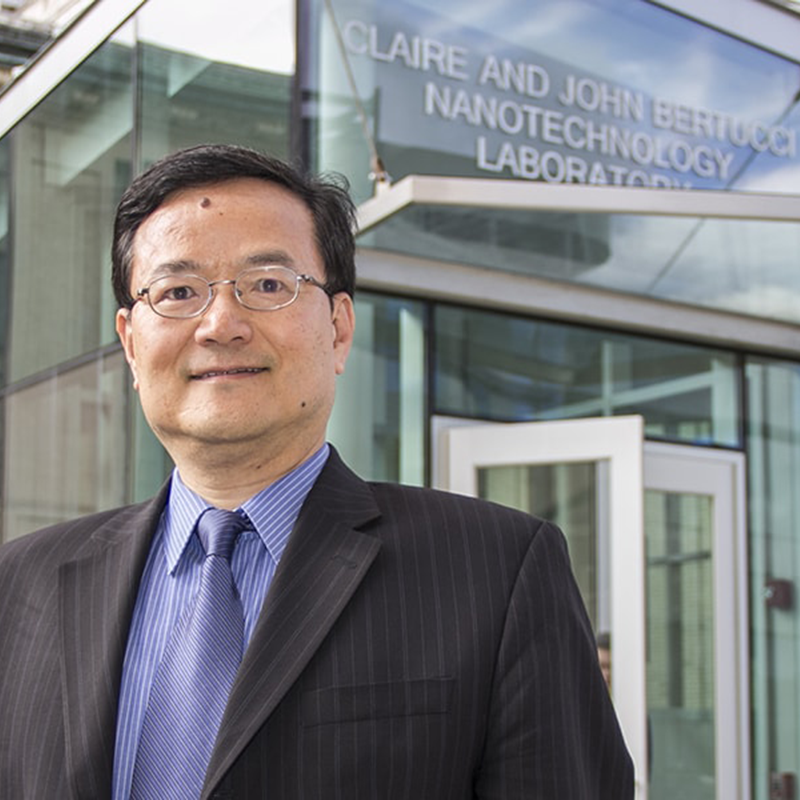 Dr. He’s research has been recognized by a number of awards. He is the recipient of the prestigious IEEE Technical Field Award of Biomedical Engineering and the Academic Career Achievement Award from the IEEE Engineering in Medicine and Biology Society (EMBS). He also received the Distinguished Service Award from IEEE EMBS, the Outstanding Research Award from the International Federation of Clinical Neurophysiology, the Established Investigator Award from the American Heart Association, and the CAREER Award from the National Science Foundation, among others. He is an elected Fellow of the International Academy of Medical and Biological Engineering, IEEE, Biomedical Engineering Society, the American Institute for Medical and Biological Engineering, among others. Dr. He serves or served as an Associate Editor or Editorial Board Member of a number of international journals in the field of biomedical engineering, and is the Editor-in-Chief of IEEE Transactions on Biomedical Engineering. He has served as the General Chair of the International Annual Conference of IEEE Engineering in Medicine and Biology Society (2009), Chair of the IEEE EMBS Forum on Grand Challenges in Neuroengineering (2010), Co-Chair of Scientific Committee of the World Congress on Medical Physics and Biomedical Engineering (2012), Chair of IEEE Life Sciences Grand Challenges Conference (2012), Chair of IEEE EMBS International Conference on Neural Engineering (2013), Chair of NSF Workshop on Mapping and Engineering the Brain (2013), and Chair of IEEE EMBS BRAIN Grand Challenges Conference (2014). He was the 2009-2010 President of IEEE Engineering in Medicine and Biology Society, consisting of 10,000+ members worldwide; and is Chair-elect of the International Academy of Medical and Biological Engineering. He has been a Member of the NIH BRAIN Multi-Council Working Group. Dr. He has been fortunate to be associated with talented graduate and undergraduate students, and postdoctoral associates, many of whom have taken faculty positions in the US, Canada, Japan, China and Korea, and in major corporations. Many of his Ph.D. students received competitive fellowship awards from various funding agencies or the University, or paper competition awards in international conferences.